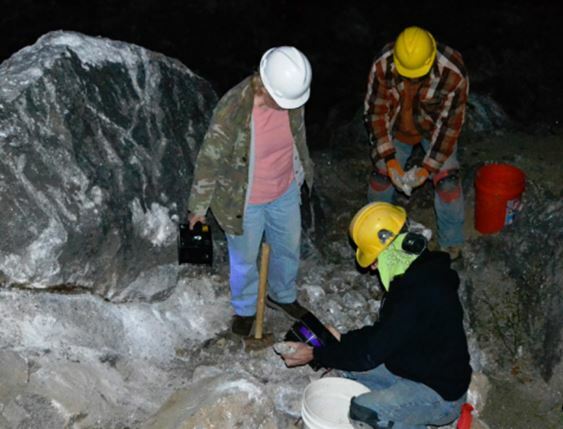 Impressed by the diverse mineralogy and spectacular fluorescence of the unique zinc ore, the Sterling Hills Super Dig is always a big draw for our club, but this year we out did ourselves. Eighteen members made the trek to north-central New Jersey. It is not clear whether we carried back a full ton of fluorescent zinc ore, but we surely tried. 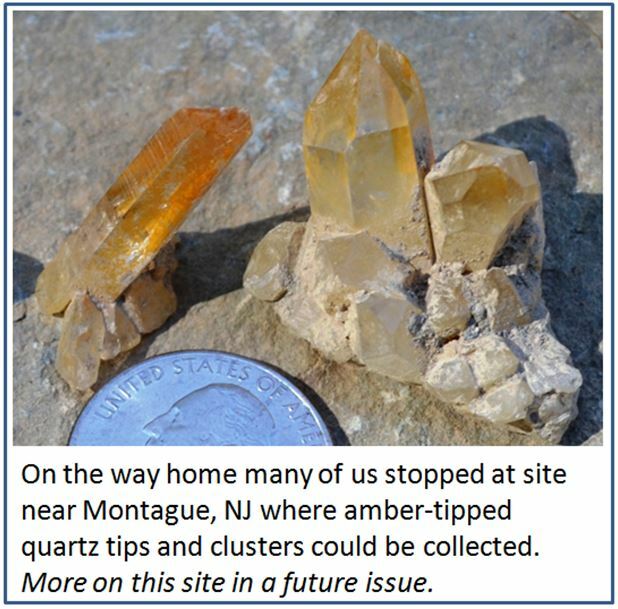 From sun-up to sun down and into the night by black light the mine area was scavenged for willemite, zincite, hydrozincite, wollastonite, and the ubiquitous red-fluorescing calcite. Jet black, octahedral franklinite is also dispersed through the rock. Wollastonite (yellow in short-wave) has been found in a boulder near the top of the mine. Willemite (green), calcite (red) and some hydrozincite (blue) were virtually everywhere. Daylight collecting also yielded fine black franklinite often set off in fire engine red zincite. No one went home feeling mineralogically slighted. Most folks also took advantage of one or more of the days underground or site tours which included a walk through the large overhead building that stands over the mine entrance. Underground visitors were treated to scenes of red, green and blue as the fluorescent minerals could be observed in place. Rock pile just inside the Sterling Hills entrance is a literal treasure trove of goodies from the mine and elsewhere (all for $1.50/pound!). But our trip to New Jersey was not just a one day affair. 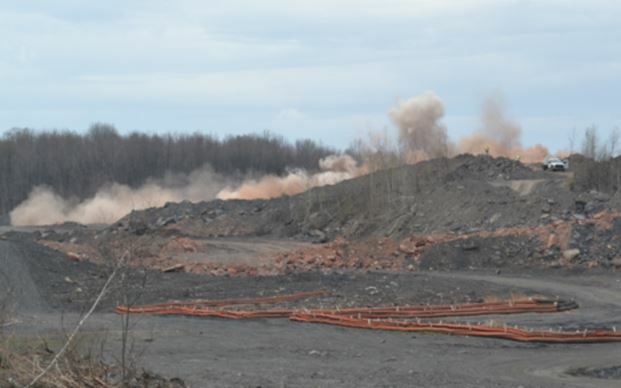 We took a side trip to the Carbondale and Archibald coal mining area north of Scranton on Friday en route to the Super Dig. 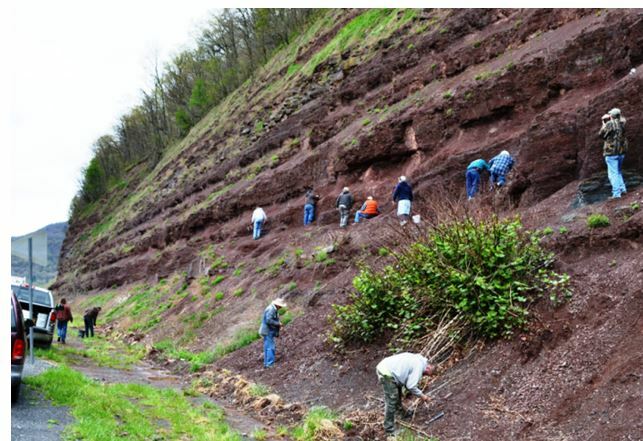 The Carboniferous coal deposits throughout Pennsylvania are accompanied by significant plant material which has been preserved in the shales between the coal seams. We were not allowed to collect inside one region east of Carbondale where a reclamation project is underway. Apparently an underground coal fire has been burning there for decades and an effort is underway to dig 150’ down to the fire and extinguish it before leveling the surface for possible development. 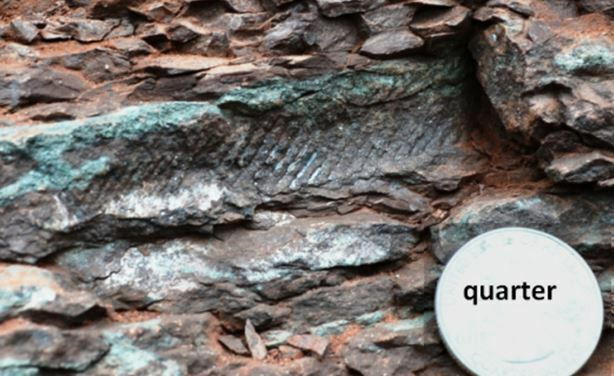 Although unable to enter the large site, we did collect several interesting plant and fern fossils around the periphery as we awaited the mid-day blast. And yes, we witnessed the daily blast, albiet it from afar. Can you spot all the red rock amidst the otherwise black coal and shale in front of the blast area? We were told that is all burnt coal and shale that has been pulled from the pit as the crew works to relinquish the fire. We wondered how many interesting minerals might be found there with shale exposed to very high temperature/ low pressure conditions. Later, we did find a large site near Archibald where both ferns and lepidodendron tree branches and roots could be collected. Carboniferous plants: The leaf clusters to the right are Annularia from the side branches of horsetail ferns called Calamites. 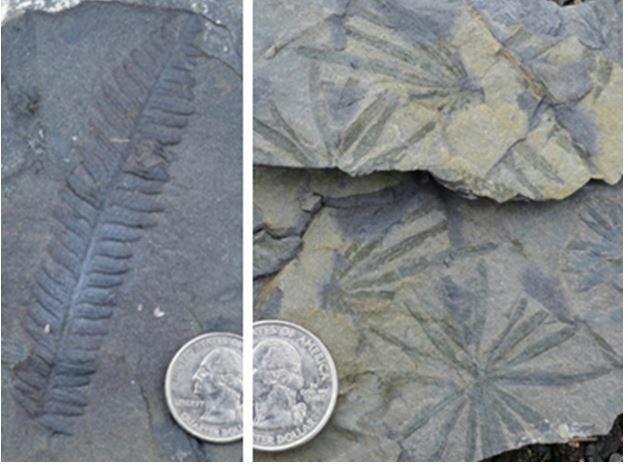 The fossil plant on the left is a Pecopteris, a seed bearing Carboniferous fern: two nice finds. 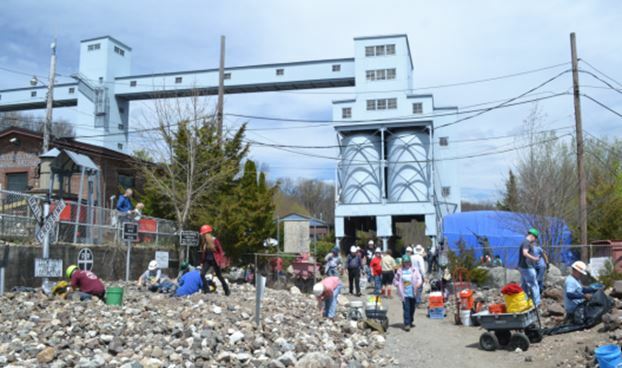 A trip to central PA and two National Limestone quarries in Synder County has become a regular WCGMC spring trip. This year we included a bonus location. 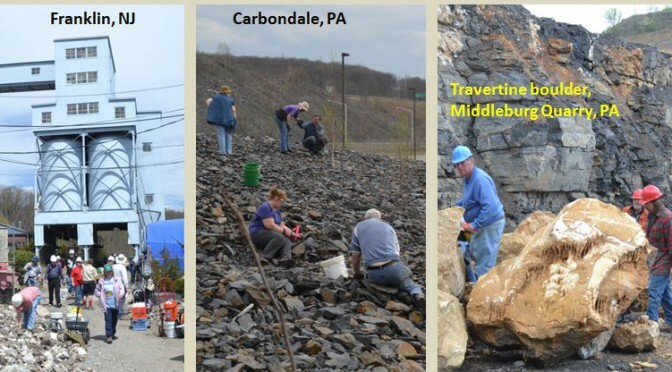 After a day of collecting wavellite, calcite, travertine (far right photo in cover picture), and fluorite in the two limestone quarries, we met up with Doug Rowe and collected Upper Devonian fish fossil scales and plants at the famous Red Hill site near North Bend, PA.
We did not find any of the earliest tetrapod fossils that have made the site famous, well except for those on display at the small museum in North Bend, but we did see evidence of fish scales and spines in the outcrop. Doug showed us the most productive horizon in the long roadcut exposure and we went at it. Glenn Weiler found the largest fish scale plate. This 3” section came out in 3 pieces, hopefully it made it home in just 3 pieces and Glenn can reconstruct a partial dorsal fin from a 265 Million Year old Palaeoniscoid fish. How neat is that! The whole crew assembled at the North Bend Red Hill Museum. Doug Rowe, museum curator and our guide for the day, is seated in the back. We thank him for taking the time to share this fascinating site with all of us. 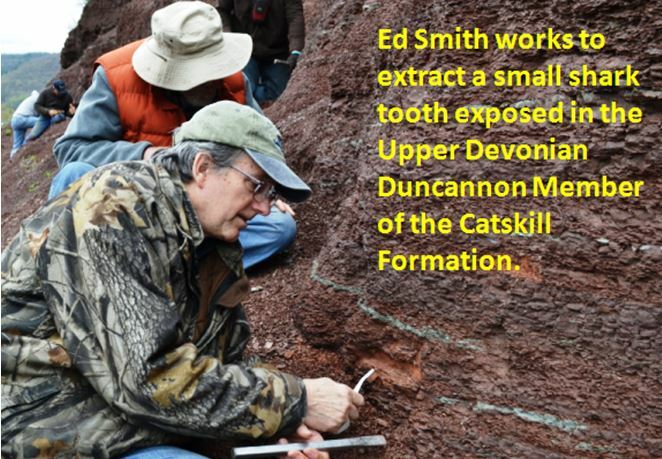 Red Hill was not the only new fossil site visited on this trip. In the late afternoon on Saturday we ventured to Danville, PA and site #50 in Robert Beard’s 2013 Rockhounding Guide to PA and NJ. Here we were still hunting in the Upper Devonian, but this time in marine siltstones of the Trimmers Rock Formation where the assemblage is much more familiar to us. 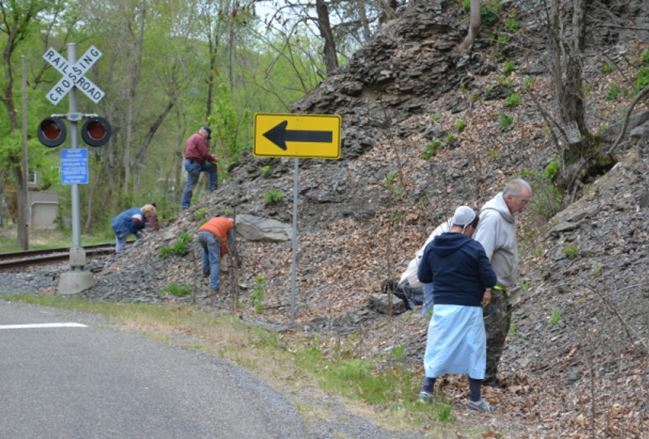 The Danville site is a roadcut at a railway crossing: easy site to find, and easy to collect. Brachiopods by the bucket full along with bivalves, and some crinoids and gastropods can be collected along the road and railroad track just outside town. They are not in the best of condition, but they are prolific and with adequate diversity to entertain a bunch of fossil pickers.